'Mosaic' was shown in the artists's solo exhibition held at Gallery A in Sydney, from which two other works in the Gallery's collection,'The crop I' and 'Enamel ware', were also exhibited, and which emphatically brought her assemblages to the attention of the Australian art world. 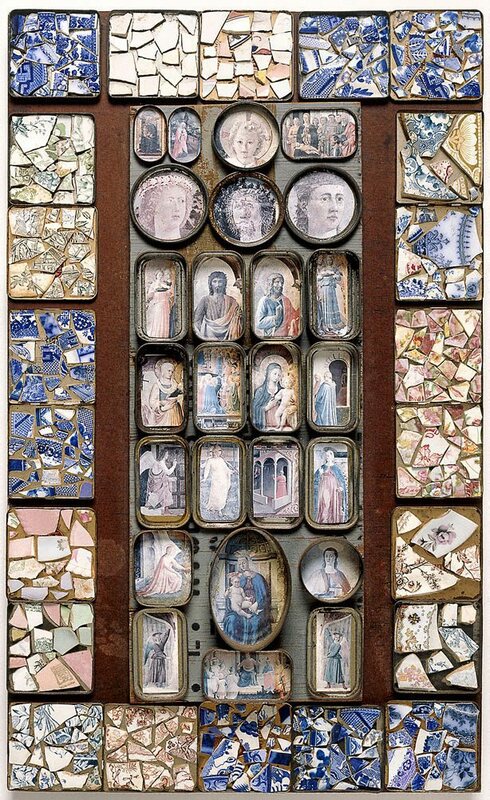 'Mosaic' draws upon the tradition of medieval icons and shrines, using fractured decorative chinaware and carefully selected images of the Madonna and other Christian figures, to create a gem-like construction which is a modern play on early Christian mosaics such as those at Ravenna. In this sense 'Mosaic' joins a number of early Gascoigne assemblages with similar 'art-historical' themes, as well as prefiguring the artist's slightly later landscape-oriented box constructions. Whilst a very early work in both conception and construction 'Mosaic' nonetheless also holds that almost universal appeal which Gascoigne's work commands from viewers ever responsive to the extraordinary allusive power of her assemblages. Field of vision. A decade of change: women's art in the seventies , 'Rosalie Gascoigne', pg. 35-36, Ringwood, 1990, 36 (illus. ).